Spotlight Solar aesthetic structures have brought solar into view for millions of people. They signal a property owner's environmental care and influence people to consider clean energy for themselves. Here are a few projects we've been privileged to work on. Florida Power & Light has made it possible for thousands of people to participate in bringing solar into public places where millions of people can see and learn about it. And they've made it look fantastic. On the waterfront in Miami is a stunning new science center giving kids a memorable experience in learning. This starts on the front porch, with two sculptural solar "trees" making clean energy beautiful and touchable. Alliant Energy, a major midwestern utility, built a solar testing and education center with EPRI. 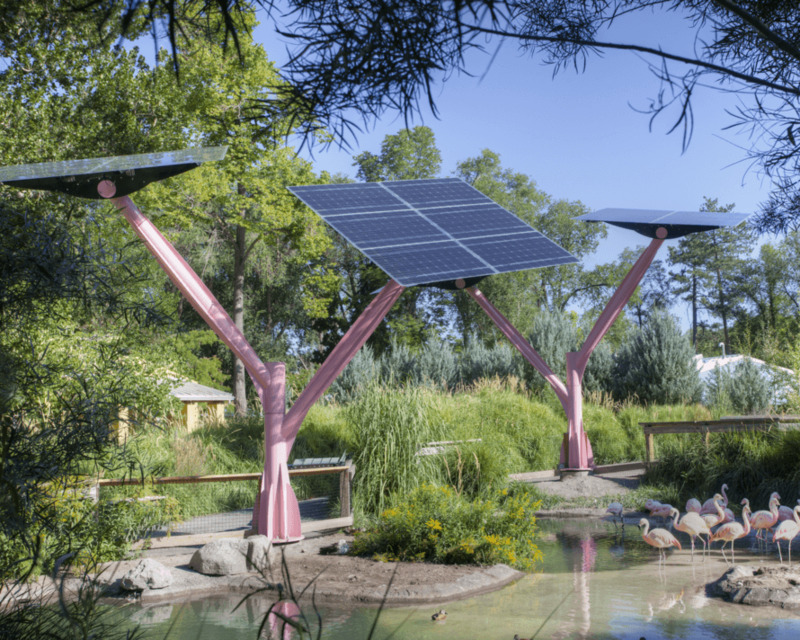 23 Spotlight Solar trees make it engaging for customers and the public. Tracy Aviary in Salt Lake educates 150,000 people per year about conservation. And their Lift structures shade visitors and flamingos alike in their most popular exhibit, inspiring consideration of solar. Wake Electric built a new HQ building, and wanted to show their support for clean energy. So they put three Industry solar trees on the porch. Among the massive space ships and the millions of visitors, there are now five striking solar structures. We’ve been told our Lift product looks a bit like a rocket. Now you can make a direct comparison. Orlando Utilities Commission, the primary utility serving Orlando, placed four Spotlight Solar structures at the convention center, as part of its advocacy for solar energy. The structures complement a 1 MW rooftop array and will be seen by 1.3 million visitors per year. Student leaders at NC State led this project to add Curve as the 12th solar system on campus. Placed right in front of a LEED silver library, it promotes energy and environmental stewardship. The school board and architect built Sandy Grove Middle School to produce 30% more energy than it uses. With its four Lift solar trees in front, it's a landmark of sustainability and civic pride. Yes, that's a kangaroo living blissfully in the shade of solar. Click the picture to learn why we love this project so much... other than, you know, there's a kangaroo! Our architectural solar structures are pretty new to the world. So, while there have been a goodly number of projects, we've got ambitions for a lot more, and hope you do too! Below are some image renderings of solar trees in situ. copy our images. share liberally. Would you like a picture of what Spotlight Solar products would look like on your property? It would be our pleasure!